Imagine you are feeling panic – and you think..ok I’ve GOT to do deep breathing! in – out – in out – one, two, three, four!! You can see that at a deep level your whole effort in doing the breathing is to desperately STOP the panic. And even if you DO stop the panic – Does that mean you have lost your fear? Maybe temporarily but deep down the fear is completely intact. You would still believe that if you hadn’t done the deep breathing – WHO KNOWS WHAT MIGHT HAVE HAPPENED!! You may then think that since you can’t do deep breathing if you are outside or at work or in a shop you better avoid those places and stick to places where you CAN do the breathing. You can see that this doesn’t really deal with the FEAR of panic – it just prolongs it. Now – let’s look at an alternative approach. Imagine again that you are feeling panic – you are overwhelmed by fear – you feel you can’t get a breath..
Ok – first notice that you probably have tightened up – fight or flight is increasing. 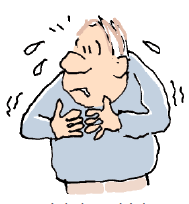 Notice that and let go your stomach muscles – your breath will flow normally all by itself. Ground yourself – feel your feet on the floor – instead of focussing all your attention on the feelings – pull back – take in your environment – let go all over. Can you see how this is different? Rather than trying to stop the panic at all costs you have met it half way. You stopped ADDING to the cycle of fear. There is a big difference in taking a good deep breath because you realise you are holding your breath or your breathing is shallow and ‘practicing’ deep breathing in a frantic attempt to STOP panic.